Veolia Environmental Services UK has bought a new Thorworld yardramp to replace a model that had been in use for 25 years at its Ellesmere Port site. Thorworld's long-standing relationship with Veolia is underscored by the provision of an annual service on each yardramp, plus employee training. A Thorworld engineer put a prohibition notice on the ramp at the site after noticing signs of failure caused by the replacement of crucial pivot pins with pins of an incorrect specification unauthorised by Thorworld, earlier in the ramp's working life. Thorworld organised a replacement and took the original to its Chesterfield site for repairs. 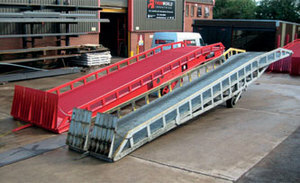 Veolia opted for a new Thorworld 10,000kg capacity Type 6 Deluxe ramp, with full width access and a 300mm deep exit lip for ease of access to trailers. The unit has fold down entry ramps, high safety side rail, multiple towing options and manual hydraulic height adjustment for efficient loading and unloading.